The 2016 Malibu has surprised everyone with its updated powertrains, expressive styling and advanced engineering. Thanks to an all-new design and platform, the new Malibu is ready to change how people view mid-size sedans as it looks forward to a brighter future. Looking at the next time you’re buying a car online, there is only one choice for you, your family and your budget. The Malibu has a long history with Chevrolet, originally starting out as a trim of the Chevelle in the mid-1960s. It later evolved into a coupe, sedan, and station wagon in the mid-1970s. After being replaced in the early 1980s, it was revived as an economy car, later evolving into a mid-size sedan. With the 2016 model, Chevy wants to start a new legacy for the Malibu, as one of the best looking and performing mid-size sedans on the market. While it’s a completely redesigned and fully updated model, it draws from a rich history which continues to produce amazing results for buyers of today and tomorrow. 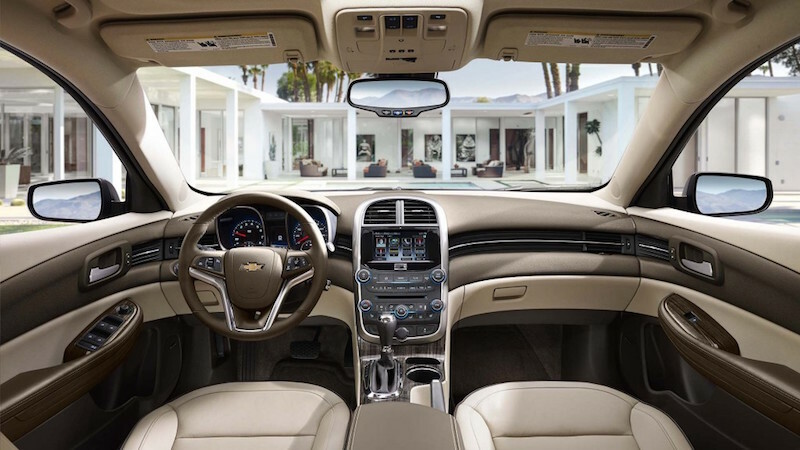 Chevy redesigned the 2016 Malibu with refinement and sophistication because we all deserve the finer things in life. They updated the Malibu to include the latest technology to speak to appeal to our senses. Truly, this new Malibu is not what you remember. It’s not what it’s been, but, like you, it is all about where it’s going. With an all new power given to the engines offering a controlled yet spirited feel, the Malibu really shines when on the open road. It’s lightness is impossible to ignore which not only contributes to its fuel economy, but also why drivers are already falling in love with it. It’s simply more fun to drive. A confident and powerful sedan with luxurious spaciousness that employs advanced safety technology along with safe driving Teen Tracker. You can choose to describe the all new Malibu however you wish, but these words most characterise and sum up its lighter feel, strong construction, powerful, eco engines and stylized design. Fully updated and redesigned wouldn’t mean much if it didn’t have the matching power to back it up. Of course, with Chevy updating their cars across the line, the Malibu was sure to get in on the new turbocharged powertrains. A 1.5L turbocharged 4 cylinder engine leads the pack to produce 160 horsepower and 184 lb/ft of torque while putting out an economical 27/37 mpg of city/highway driving. Still hoping to take the family sedan out of the last generation, another engine is available. A 2.0L turbocharged 4 cylinder will deliver much more horsepower at 250 and 258 lb/ft of torque while still improving on previous generations fuel economy: 22/32 mpg city/highway. Always promoting responsible fuel economy by employing Stop/Start technology which automatically shuts off the gasoline engine at the completion of a full stop to avoid wasting fuel. Continuing the tradition of eco-engineering, the Malibu Hybrid also was updated. Promising pure electric driving as long as staying within 55 miles per hour, you should get be able to save quite a bit of time, energy and cash not stopping at gas pumps. Getting an estimated 48 mpg in the city, this hybrid continues to impress with its powerful delivery of 182 horsepower and advanced fuel saving technology where the engine automatically switches from gas to electric mode or uses both depending on the power required. The Malibu Hybrid also employs the use of Stop/Start technology which uses intelligence to shut off the gasoline engine when idling so as to preserve and not waste any fuel. This not only saves you money at the pumps, but eliminates fumes exiting the car when it’s not in use. 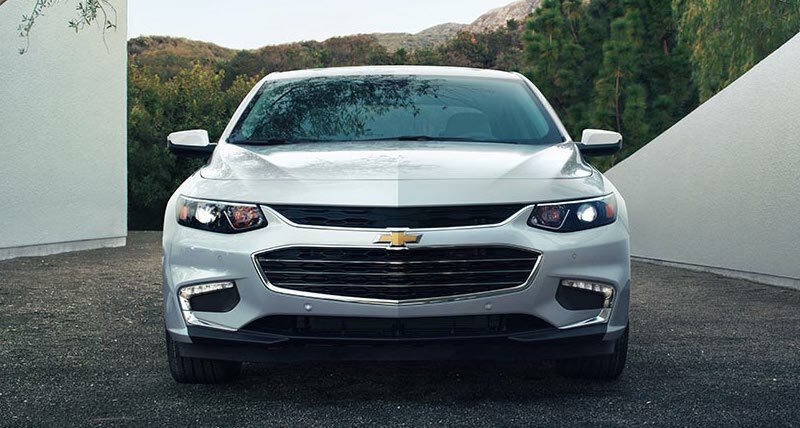 Chevy is proud to offer such a competitive hybrid to its lineup. While the complete redesign meant a departure from its history and what it’s been, which is quite a decorated past, Chevy wants to focus on the future and all that the new Malibu has in store. Dispensing with the past, the newly redesigned body has stylish curves and utilizes all new sheetmetal that offers a cleaned up, luxurious look. The front fascia, while a bit more aggressive than we’d expect has profile character lines that appeal more to an European audience than Chevy’s normal customers, especially for an entry-level sedan. However, as Chevy realized with this generation Malibu, there is no room for error in this highly crowded mid-size sedan segment. Contributing to its luxurious feel are the LED daytime running lamps and LED tail lamps. On the interior, drivers and passengers alike are spoiled with premium features like ventilated seats, more LED lighting, and an 8-inch touch screen with Chevrolet’s integrated MyLink system offering 4G LTE WiFi. Having increased the wheelbase another 3.6 inches than its predecessor, it adds an additional 2.3 overall inches. The result is an extra 1.3 inches of rear legroom, which all passengers can take full comfort in and advantage of. As a driver in today’s world, staying informed and connected are truly important. The use of advanced technology allows for all passengers to stay entertained with on the go with a built-in 4G LTE Wi-Fi. As the first midsize sedan in its class to offer such improved technology, the 2016 Chevy Malibu keeps all passengers connected to their outside world and on the edge of the latest technology. Offering only the best in advanced safety features, the 2016 Chevy Malibu operates to protect driver and passengers from potential collisions. An optional state-of-the-art OnStar technology is available to provide immediate assistance by responding to a collision of any kind. Other features like Lane Keep Assist which warns driver when vehicle starts to roam into another lane, Rear Cross Traffic Alert which employs the use of sensors and rear camera to monitor traffic behind you, and Forward Collision Report which alerts the driver on two separate occasions; Tailgating Alert warns you when you are following someone too closely and a Crash Imminent Alert when you are approaching a vehicle too quickly. One of the Malibu's most innovative features is the Teen Driver mode. This allows parents to monitor their children's driving, which includes the ability to see top speeds, distance traveled, and be notified with certain safety features are activated on the 2016 Malibu. Chevrolet's inspiration for this feature is the fact that the fatal crash rate for drivers under the age of 20 is 3 times higher than that of drivers over the age of 20. The goal is to allow parents to not only monitor their children's driving habits, but to help teens learn to become better drivers. Being that Chevy finally got it right with its updated family size sedan, it need to be priced to match. Given its major updates to its powertrain and hybrid engine and stunning redesign, you should expect to pay in the higher $20K to mid $30K range, but this Malibu is priced to stay right in the market it belongs. It’s no secret that families these days live on tight budgets and to get the most out of your dollar you must be picky about how you pick your big ticket items. As highly competitive as this segment is, families do have the upper hand on being as particular as they wish. Chevy has produced a Malibu that is as stylish as it is gorgeous, as fun as it is responsible and all of it is economically priced starting at just $21,625.